We are social creatures so it is little wonder that social media has taken off in such a big way. Ninety-eight percent of all internet users have a Facebook account. Social Media is here to stay for a little while at least. A social media campaign is an important part of promoting your business or organisation on the internet. Some businesses choose not to have a website at all but focus their energy on a Facebook page for the business. You don’t have to spend a cent on your social media campaign, but you do need to make a regular time commitment to read, respond and post to your social media platforms. Facebook is the most popular social media network so your Facebook business page is a good place to start your social media campaign. Setting up your business is free, but you will need to spend some time to produce quality content for your visitors. Aim at producing compelling content that others will share. 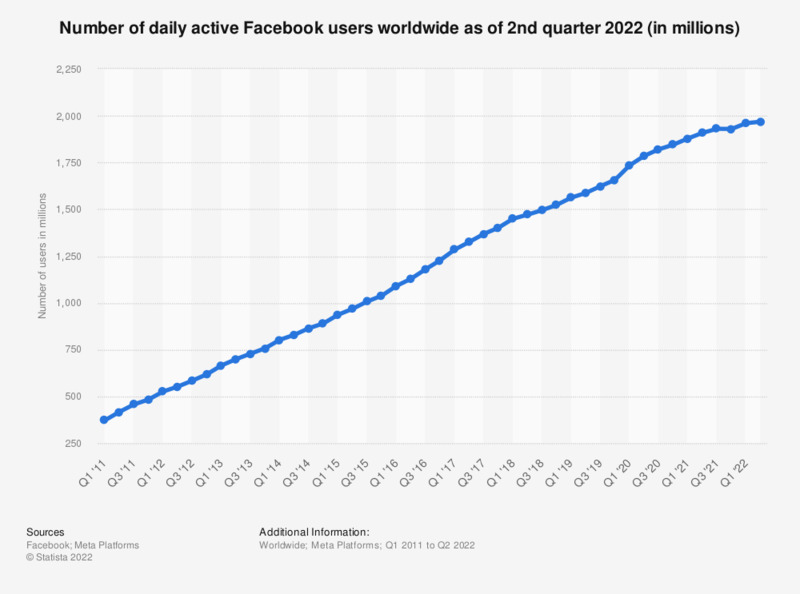 Below is a graph showing how many active Facebook users from 2011 to 2016. Creating a Facebook page for your business is a good way to start your social media campaign because Facebook is the most popular social media platform. You need a personal Facebook account to set up a business page. To set up your business page, open your personal Facebook account and hover over the triangle at the very right-hand side of the header and a dropdown list will appear like the one below. Choose the “create page” option. Next, choose the type of page you would like to create. If you choose “Local Business or Place” you will be presented with a small form. Choose from the category list that best matches your business or organisation. It is worthwhile to take the time to read Facebook Pages Terms. They are not very long and are written in plain English. Enter a description of your business and the address of your website on the next page. Here you also have the chance to choose the name of your Facebook link. Choose a name as close to your business as you can – depending on availability. Continue through the process, choosing an appropriate profile picture and cover picture. The cover photo should be 828 PX wide by 315 PX high. This is different from the Facebook cover photo on your personal page which is 851 PX wide 315 PX high. You need to get people to like your page so ask your Facebook friends, your customers and potential customers to like your page. Once you get 50 likes you will get valuable information about how your page is performing. Develop an appropriate schedule for posting and post regularly. Make sure that your schedule is realistic and you can maintain it over a long period of time. Post interesting information about your industry, upcoming sales, updates to your website etc. Mix your content between promotions and information. Too many promotions will drive people away. Experiment with the type of content to see what works. Also, experiment with the time you post to see when you reach the most people. This may change each week. Target your content towards people who are likely to use your business. Facebook is so popular it is hard to get your business page to be seen amongst all the other business pages. Not all your posts will be shown to all the people who like your page. So basically the upside of setting up a Facebook page for your business is that there are a lot of Facebook users and the downside of Facebook for your business is there are a lot of Facebook users so there is plenty of competition to be seen. If you want to succeed on Facebook you need to cultivate likes for your business page and post interesting content regularly. Here is a blog post about three businesses that left Facebook and three businesses that stayed and have a successful Facebook campaign: Should your business say goodbye to Facebook. There are more than 300 million Twitter users, which makes it the third most popular social media platform. It is popular with young professionals. Twitter limits the length of “tweets” to 140 characters, allowing busy people to tweet and to read tweets throughout the day. Follow people on twitter that have similar interests to you in business and sport as well as your friends. Of course, you also need to have followers otherwise nobody will see your tweets. Set up your twitter account at twitter.com. You can only set up one twitter account attached to an email address. If you want to set up another twitter account, you will need to use a different email address. Decide on a “handle” that is easy to remember and as short as is available that represents you or your business. Your twitter address will be twitter.com/yourhandle. You also should include a profile picture of yourself. Once you have set up your account, ask your friends, clients and business associates to follow you on twitter and post regular interesting tweets. Use the search form to find people you want to follow. You don’t have to get the person’s permission to follow them. You can use the hashtag in front of keywords in your tweet to highlight the keyword and make the tweet easier to find in a search for that particular search term. A hashtag keyword does not have any spaces and so all the words are combined to form one word, for example, #webdesign or #WebDesign. Don’t stuff your tweets with hashtagged keywords because it will make your tweet hard to read and will not produce any better search results. Use no more than two hashtags in any one tweet. The at (@) symbol is used in front of someone’s handle when you are speaking to a specific person or persons. Twitter automatically puts an at symbol at the beginning of a reply. If you include Twitter in your social media campaign, twitter regularly. Twitter interesting information about your particular industry, retweet interesting tweets, run competitions but don’t over twitter. People will unfollow you if you clog up their Twitter feed with useless information. LinkedIn is considered the business persons social media platform. It is the largest professional network. Go to LinkedIn.com to set up your LinkedIn account. Include a good quality picture of yourself for your profile picture also include a list of your skills. When you have finished setting up your profile, connect to your friends and business acquaintances. Endorse others for their skills and hope that they endorse you for some of your skills. Find groups that correlate with your business or interests and contribute to them by either asking questions or commenting on other member’s questions. Keep your profile up-to-date and honest. People use LinkedIn to recruit for jobs, so ensure that you always act in a professional manner on this platform, it is not the place for social chit-chat. Google + is considered both a social and a professional social networking platform. It differs from other social sites because you can group your contacts into circles. When you publish some content you can choose which circles can see your posts. Google + is like the Swiss army knife of the social media platforms and it integrates with both Google Search and Gmail. Likes both Facebook and LinkedIn you can form or join groups and those groups can be either private or public. Google + is also integrated with YouTube, making it easy to post videos on your Google+ page. In January 2016 there were a mere 60, ooo regular Google Plus monthly users in Australia compared to 15,000,000 Facebook users (from Social Media Statistics Australia – January 2016). For some reason, Google plus has not gathered the momentum Google was hoping for. Maybe because Facebook started in 2004 and was well established by the time Google Plus started in 2011. Maybe also because Google + is more complicated than Facebook. It is still worthwhile to set up a Google Plus account because of the benefits it offers to promote your business on Google. To get started in Google + you need a google account. If you have a Gmail account or a Google Analytics account, then you already have a google account. Go to plus.google.com and fill in all your details. You can decide who sees your information by choosing one of the following icons. People in your circles and people in your circles’ circles can see the information. In the custom settings, you can choose either, which circles see your information or which of your followers. There is no paid advertising on Google+ and no pressure to advertise your business. To set up your Google Business page, open your Google Plus page and click on your picture at the top right of the window. Google will verify your address by sending a card to your address with a verification number. You will need a physical address rather than a Post Office box. When your business has been verified it will appear on the right-hand side of the search results in Google for appropriate searches. Customers can access your website, add photos and post a review of your business, all from Google search. YouTube is the second most popular search engine (“Boomers Ultimate Guide to Social Media Marketing” by Kalynn Amadio, page 64). It is owned by Google so anything you put on YouTube will rank highly in that search engine. The main activities on YouTube are posting and viewing videos. To set up your YouTube account go to YouTube.com and click on the Sign In button in the top right-hand corner. The next screen will give you the option to create a Google account or use an existing Gmail account. Follow the prompts to set up a studio and channel. Once you have set up your channel you can publish videos by clicking on the button near the top right-hand corner. Short ‘how to’ videos are popular on YouTube. Pinterest is a photo sharing website. It is popular among women with an above average household income. You can become a member by using your Facebook login. After you become a member you can create boards for groups of photos. A picture uploaded to Pinterest is called a pin. You can share other people’s pins on your boards. Below is an example of a home page on Pinterest. Add Pinterest to your Social Media Campaign if you have a business that caters for the needs of young women. For example, if you have a hairdressing business pin pictures of hairstyles on your Pinterest board and if you are in retail post pictures of your products on your board. To set up a Pinterest account first choose your username. If you are using Pinterest to promote your business use your business name as your username. Write a paragraph about yourself and what you are interested in. You can connect your account to your Facebook page and your twitter account. Include your website URL in your profile. When you have set up your profile you can start to pin content. Pictures and videos are pinned on boards so think up some interesting boards to pin your content. You can tag others in your pins using the @ symbol. Just like in other social media platforms you can comment on, like or re-pin other people’s pins. Instagram is a mobile photo-sharing social network popular among teens and young adults. You can take a photo with your mobile phone, use one of Instagram filters and share it on Instagram, Facebook or Twitter. Like other forms of social media, you can use hashtags (#) and @ symbol. Use Instagram to promote your business by taking interesting pictures of your business or products. Behind-the-scenes pictures can be shared to show the human side of your business. Encourage your customers to post pictures of themselves using your products or services. Rewarding your customers for promoting your business on Instagram will encourage engagement. Snapchat is dominated by young people, especially university students. It is also a relatively new social media network beginning in 2011 compared to Facebook which started in 2004 and LinkedIn began in 2002. Snapchat is growing in popularity and is taking over Instagram as a photo sharing social media app. Snapchat is different from other social media platforms because once a “snap” is viewed, it disappears, never to be seen again. Your snap can last from between 1 and 10 seconds. It is up to you to choose how long the snap will last before you send it. Snaps cannot be liked or shared. You can use Snapchat stories to show snaps over a 24 hour period. The snaps disappear individually when their 24-hour limit is reached. This is a great way to share a day in the life of your business. Here is a guide from Sprout Social that will give you all the information about the size of each picture for the different social media platforms. Decide what social media platforms best suit your business and set up accounts for each of these. Decide how long you can spend on your social media campaign each day (from 20 minutes to 1 hour). Decide who will be making status updates and how often updates will be made. Set aside at least two times a day to spend on social media. You will reach a greater audience if you post more than once a day. You may need to limit the time you spend on social media if you find it is interfering with your work productivity. Decide on the content you are going to post on different social media platforms. First, establish who your target audience is. What is the age group you want to communicate with? Is your product used more by males or females or both? Develop personas of your target audience. A persona is an imaginary character that has the characteristics of your target audience. You can develop several personas for your business. Each persona is assigned different goals, level of experience, gender, age, occupation, and other characteristics. Choose an appropriate picture for each persona and list the characterises alongside or below the picture. Use your personas when you are creating web content, user tasks, or developing your social media campaign. Once you have some idea of your target audience, you will have a better idea of which social media platforms suit your business. Choose two or three social media platforms at the beginning. Create a plan of your social media activities including the time of day and how long you can afford to spend on your social media campaign. If there are other people in your business who are willing to contribute to the business social media strategy, set guidelines on what they can post. Make sure that you post quality content regularly. The aim of your social media campaign is to build a community of people who trust you and your business. You can share interesting blogs that relate to your business. Take pictures of your products and post them on Instagram and Pinterest. Let your customers know when you are having a special sale. Find interesting quotes to post on Twitter. Take an interest in other people on social media and like and share their content. Keep track of mentions of your business on social media. You can do this through Google Alerts and Social Media Mention tools like Hootsuite. Do not ignore or remove negative comments but respond to them in a short, curious post and give them a chance to communicate with you off-line. Although social media is free you must be prepared to spend some time using social media each day if you want to conduct a successful social media campaign. Use your personal Facebook account to interact with people on a personal, friendly level. Let people get to know you as a real person who cares for others. Set up your Facebook business page and post regularly. Post interesting snippets relating to your business, comics, competitions and updates to your business. Twitter is a good platform to follow the people you like and admire in your industry. Set up your LinkedIn profile to establish your professional profile online. If you have a local bricks-and-mortar store, you should set up a Google + account and set up a business page. Having a Google+ account will help your search engine rankings in Google.